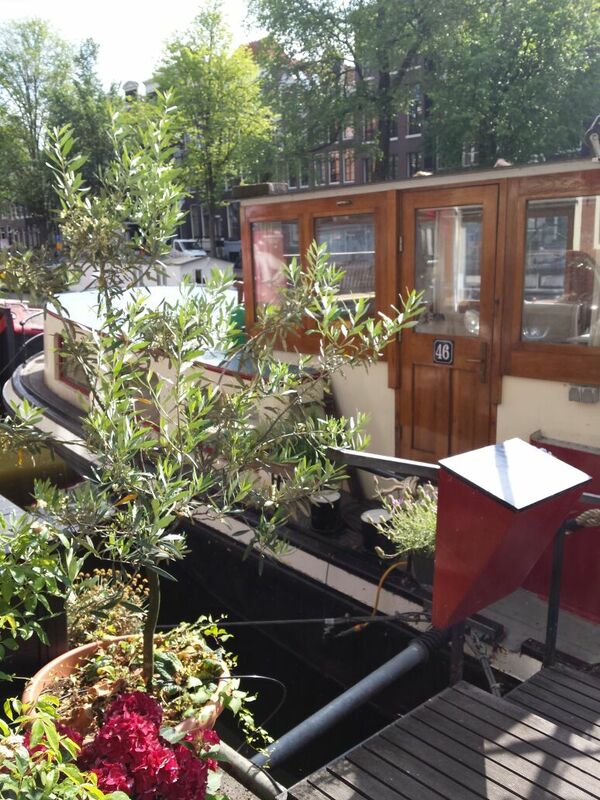 Home for a few days: Amsterdam houseboat. Thanks Airbnb. 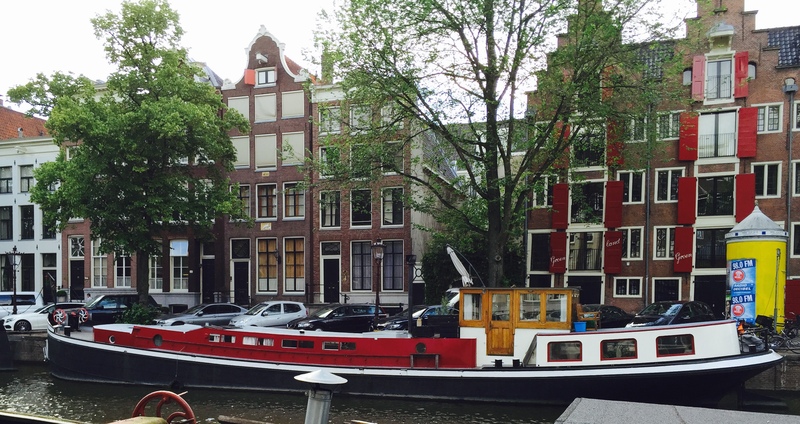 I had initially planned to go to Amsterdam on my own. Just three days- mostly to make sure that I visited at least one new (for me) country in 2015. 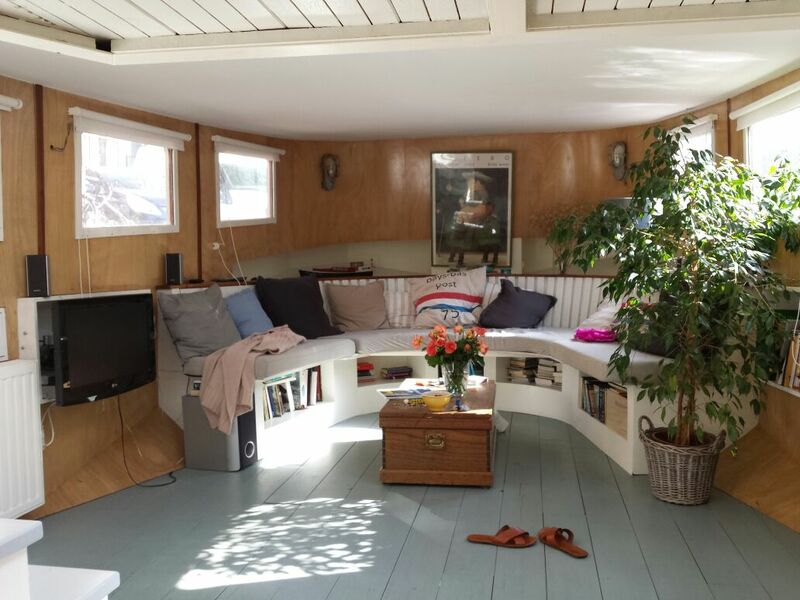 I wanted the experience to be special, so instead of a predictable hotel I rented a houseboat. (above) You should do this. And then, I had a brilliant idea. I decided to see if my dear friend Regine could join me. She was going to miss the conference in Antwerp (see forthcoming post) for the first time since we met at the International Conference on the History of Cartography (ICHC) in Budapest in 2005. We first met after a tour of the exhibit Margaritae Cartographicae at the National Széchenyi Library. We were both inspired to order beer and watch the sunset against the parliament buildings and Danube. We’ve been friends ever since. It was short notice, she is working on her dissertation, she has a little boy. But she still said yes! 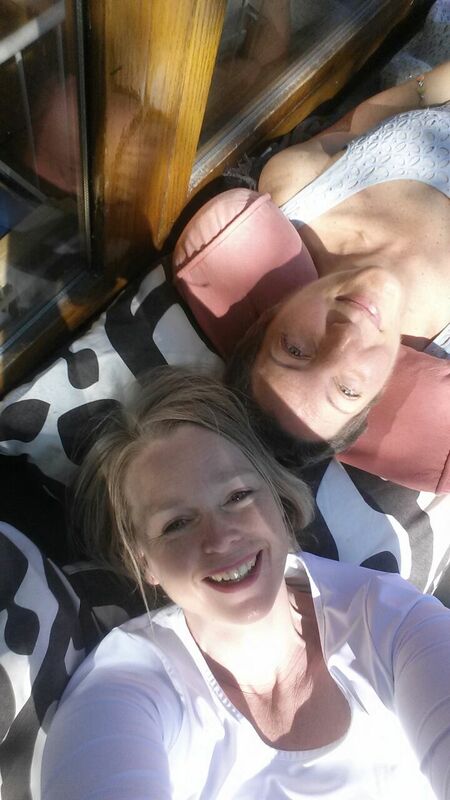 Much of our sipping was confined to the boat. I mean- why leave it? We had coffee and local pastries in our pajamas on the top deck in the mornings, waving at the tourist boats that passed by as if we lived there all the time. In the evenings we drank wine from the local shop or the beer she brought from her hometown of Hamburg. 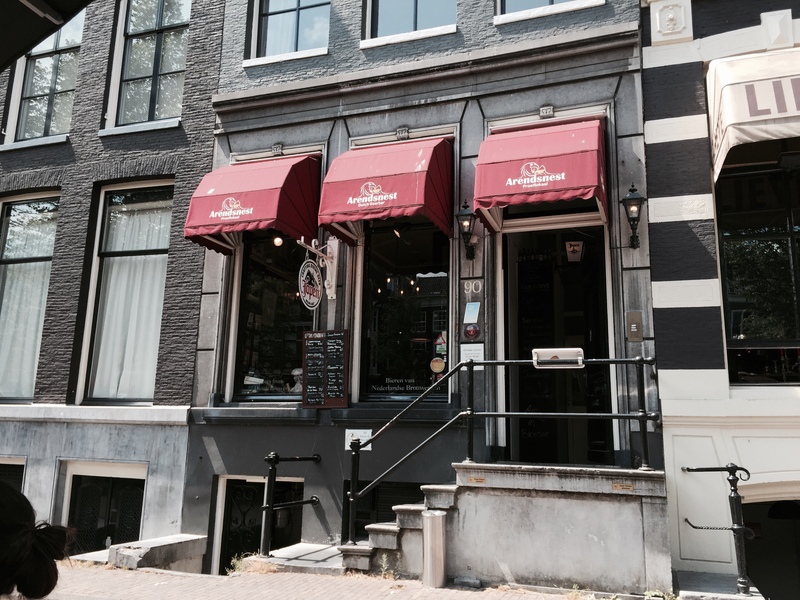 After exploring canal streets, shopping for flowers and tasting lavender and honey goat cheese- we accidentally stumbled on the best known craft beer bar in Amsterdam, serving only Dutch craft beer, called t’ Arendsnest (the eagle). It was around the corner from our boat. There is a bar inside, but if you can- sit at one of the few tables outside by the water. The food menu is essentially sausages and cheeses. 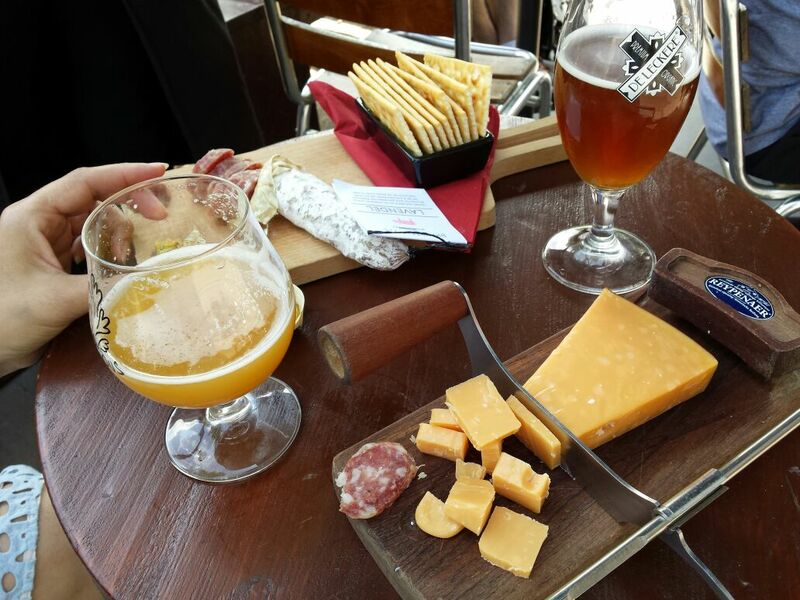 We loved the lavender sausage and the two year aged cheese with crystals that crunched against our teeth. Later (it was so good we returned the next day) we had the smoked, almost raw (if that’s possible) beef sausage. The great discovery, after trying many samples to find a beer she liked and finally taking a sip of my rye IPA, was that Regine is a hop head! When the super folks at t’ Arendsnest discovered this, they gave us a couple of bottles of their off-menu “homebrew” which is part of their “Fat Five” series. 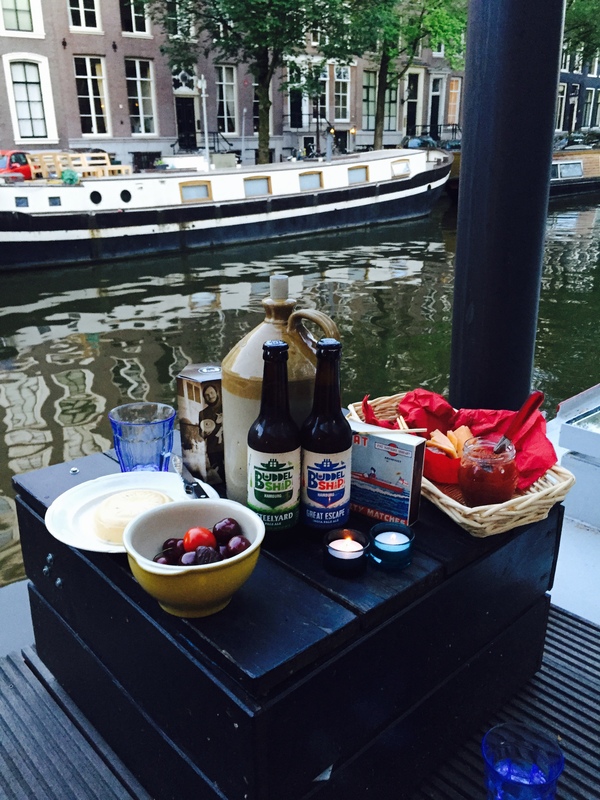 Picnic on the deck of the houseboat with hand-carried craft beer from Hamburg. Regine discovers she is a hop head! We both brought guidebooks, and Regine’s German version had something mine did not: a section on Amsterdam’s secret gardens. 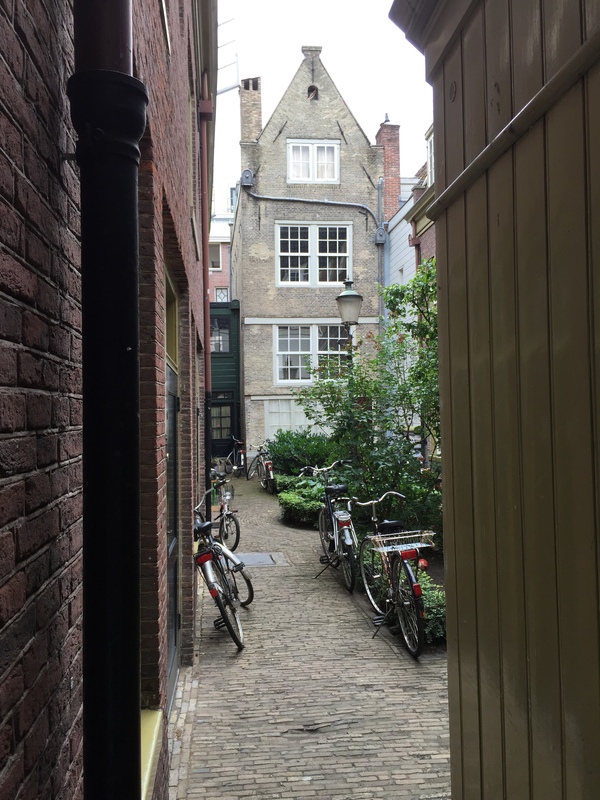 Apparently these gardens are hidden behind homes and accessible only to the surrounding residents, but some of them open a door to the street on occasion and allow people to wander in. All of the ones in her book were inaccessible though. After the fourth street, just as I began to get grumpy, we found a secret passage. 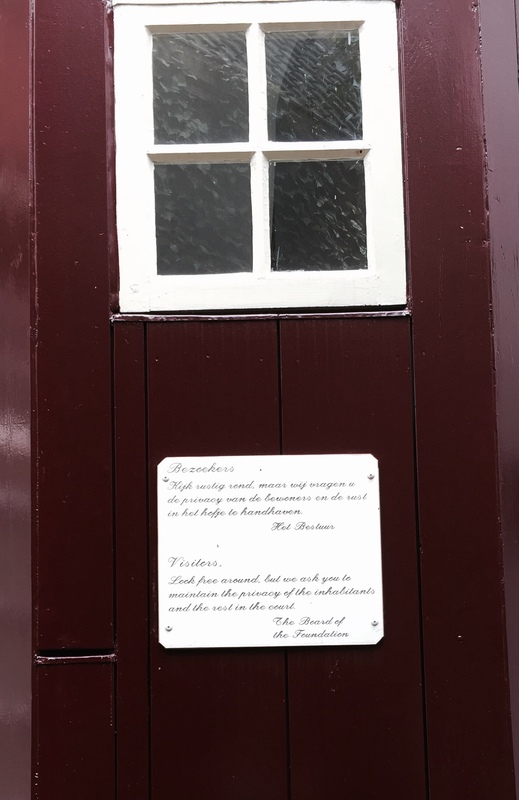 A Hofje! We nearly tip-toed through, not wanting to disturb the magic air. Other than a glass of rosé in the Miró gardens, and an espresso in a lovely rose-laden café with real candles burning on the bar and every table in the middle of the day, we had one meal off the boat. And what a meal! Regine passed it on her walk from the train and said it looked good, and the Airbnb host listed it on his “top 10 local places”- what further recommendation did we need? 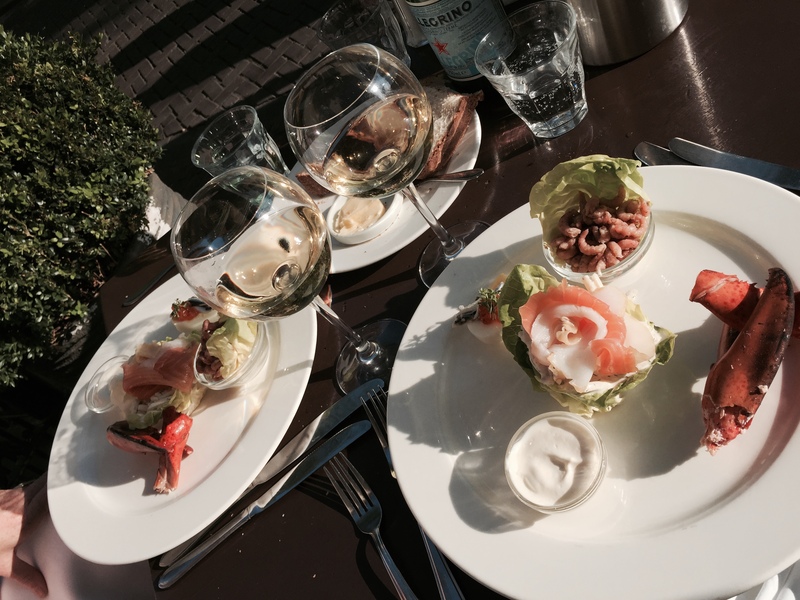 We called for a reservation for an outside table only two hours before we planned to eat- and got it. Our view was better than a painting- the sun glittering on the water and dappling the trees, a perfect breeze, a lovely aroma in the air. They brought us a couple of house elderflower vermouths as an aperitif, and the perfection was sealed. But was it the eel and crawfish velouté, the fish sampler (above), the foie gras “sandwich”, the two bottles of flinty white wine we shared that made this such a spectacular meal? 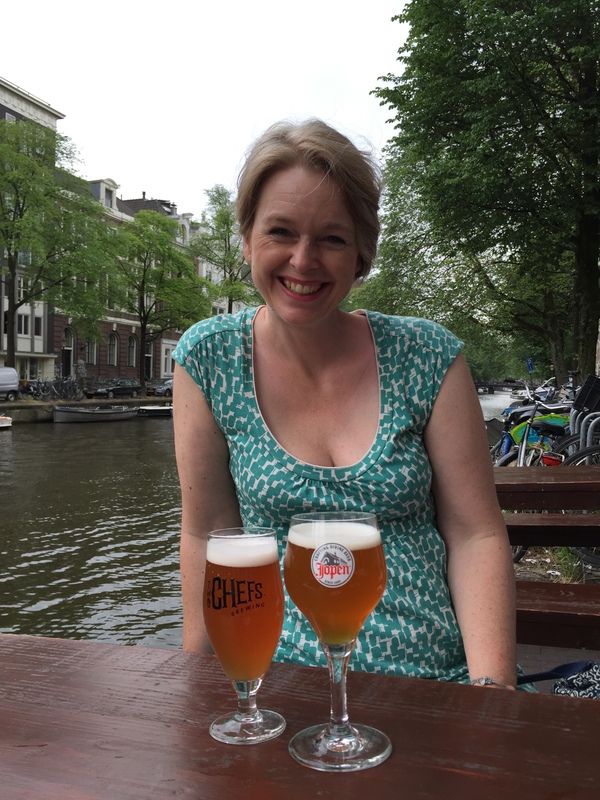 Of course it all helped- but in truth, the boat, the museums, the food, all the imbibing, and the magic that is Amsterdam- were intensely magnified because I shared it with my dear friend. We could have been anywhere. One of our strolls brought us to the Begijnhof, a well-kept garden connected to a church. Since the middle ages, single elder women (not nuns) have lived in these private homes and tended to the church and gardens. As we walked by, arm-in-arm, we paused to look at the quiet, elegant homes. Regine said, “The one with the green door.” We smiled and continued to the street, imagining our golden days in Amsterdam. Sundown from the deck of the boat.